OTTAWA -- Canada's national target set by the Conservatives for cutting greenhouse gas emissions should be considered a floor for future action, federal Environment Minister Catherine McKenna said Monday. 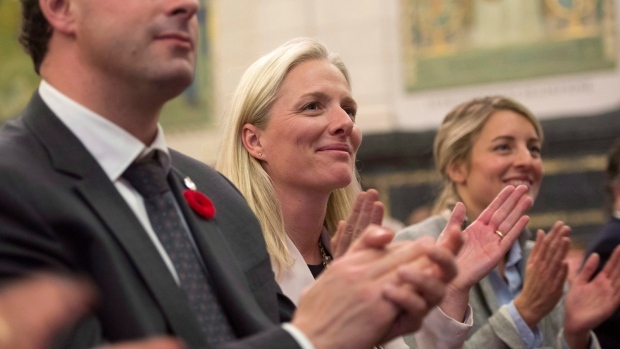 The new Liberal government has so far refused to set a carbon reduction target in advance of the COP21 international climate conference that begins at the end of the month, citing the need to consult with the provinces before putting in place a credible national plan. But with environmental groups loudly complaining that Prime Minister Justin Trudeau will take Stephen Harper's climate plan to the world, McKenna moved Monday to put some parameters around Canada's position. McKenna is in Paris attending ministerial meetings in advance of COP21, where the international community hopes to set in place a post-2020 framework for global action on climate change. The Conservatives announced in May that Canada's contribution to this year's Paris talks would be a 30 per cent cut in greenhouse gas emissions below 2005 levels by the year 2030. Canada, however, is currently not on track to meet its existing 2020 cuts under the 2009 Copenhagen accord, and the Harper government did not provide any policies to meet the more ambitious 2030 goal. "Yes, that will be the floor, but certainly we want to try to do better," McKenna said in a conference call after repeatedly skirting the question of targets. The key, she said, is "to figure out what you can actually do. You can have a target, but you have to be able to meet the target and you have to take concrete actions toward those targets." Canadian governments -- Liberal and Conservative alike -- have previously agreed to international carbon cuts, but failed to implement the policies needed to make those cuts a reality. The Conservatives famously failed to regulate the oil and gas sector despite promising to do so for the better part of a decade. "That is why it is so important to sit down with the provinces and territories and look at how we can all do our part," said McKenna. "Much of this is in the jurisdiction of the provinces." Provincial premiers have been invited to join Trudeau in Paris at the begining of December, but it remains unclear what specifically Canada brings to COP21. McKenna, an international trade lawyer who worked with the United Nations in negotiating a peace agreement in East Timor, said she's had bilateral meetings with France's foreign and environment ministers and Mexico's environment minister and plans to meet with her U.S. counterpart before returning to Canada on Wednesday. She's joining climate negotiations that have been years in the making, with several major sticking points still remaining on the eve of the full conference. These include climate finance, mitigation and adaptation funding for developing countries, and getting more countries to the table in Paris. McKenna specifically mentioned Canada's leadership in la Francophonie, the international club of French-speaking countries that Canada helps heavily subsidize, and the Commonwealth. "In some ways it's a good time to come in" to the negotiations, she said. "This is what I've been told by my colleagues, because we bring new energy." But energy, goodwill and a readiness to negotiate with Canada's provinces will only go so far, environmental groups said Monday. Federal-provincial dialogue after a decade of division is a good thing, said Stephen Guilbault of Equiterre, but he reminded the Liberals that at some point they'll have to make some tough decisions. Citing Saskatchewan's premier, Guilbault questioned whether "Brad Wall is going to have an epiphany and say, 'Oh yeah, let's go ahead, I'm full in.' No, we have to be realistic about that. We won't get everybody on board." McKenna, for instance, was unable to say how the Liberal promise of tougher environmental assessments might apply to existing pipeline applications already under review. She said she'll travel to Alberta next week to meet her counterpart in Rachel Notley's NDP provincial government. "We will have a great difficulty in getting our resources to market if we can't show that we are taking credible action to tackle climate change," said McKenna.